What is worse on a hot day in Florida than a pool in need of pool pump repair in Palm Harbor? Nothing. Just imagine the sun is scorching, the tar is melting, your seatbelt buckle burns you as you go to strap in, you’ve just left after a long day sitting in a hot office that despite the amount of AC blasting, refused to cool. The one thing on your mind as you’re sweating through your shirt during rush hour is jumping in to your refreshingly cool amenity. You sit there envisioning yourself on a float with a pina colada in hand. The Gulf water tempts you but you resist, knowing that you’re almost there. 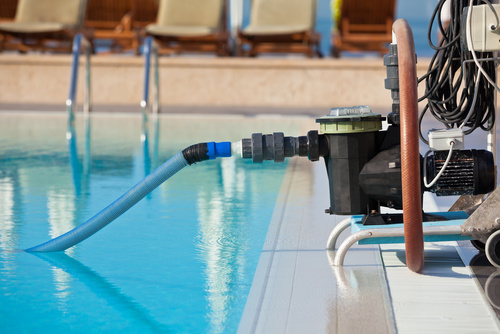 Needing to call a Palm Harbor pool pump repair service is the last thing on your mind. You pull into your drive way and peel yourself from your car’s seat, your shoes sizzle as you move as quickly as your weak body can handle. Your house is boiling but you persevere and find your suit. As you open the back door leading out to your safe haven you stop dead in your tracks. You fall to your knees as you look out to what should be a crystal blue body of water and find nothing but swampy green muck. “WHY? !” you yell out through dehydrated lips. You sit there not knowing what to do but only getting hotter as your blood boils over the situation. Instead of developing third degree burns as you fume over your malfunctioning pump, call Triangle Pool Service. We are your full service swimming pool repair specialists serving the areas of Largo, Clearwater, St Pete, Seminole and Palm Harbor. Since 1959 we have been helping people just like you. In fact, we are people just like you. We are local Floridians and pool owners. Fortunately we are trained experts on pool pump repair. We also specialize in commercial management, cleaning, service and repair. Regardless of how unbearably hot it is outside it is important to NOT jump in a body of water in need of pool pump repair. If the green swamp like water isn’t enough to deter you, consider the pH level, the potential creatures lurking just below the surface and the harm it can do to your body if you were to give in and take the risk. If you are faced with a body of water that is a hue of green go inside and call Triangle immediately. Our experienced staff will get to you in a timely manner and evaluate the situation. We will treat your water with the necessary chemicals, repair the pump, and take precautionary steps to avoid this catastrophe from occurring in the future. When you call us to perform a pool pump repair on your suffering amenity we will do so promptly, affordably and while offering exceptional customer service and quality craftsmanship. We will inspect all of the involved parts to ensure that everything is running smoothly. When we are finished with the repairs and the water is returned to a healthy pH level and a more welcoming aqua color you can dive right in. When Triangle is your service provider you can sit at your desk on a hot summer day dreaming of floating in an aquatic paradise sipping a margarita without the haunting memory of the day you required pool pump repair. You will not have to fear going home to a swamp and refrain from imagining because you don’t want to get your hopes up only to go home to a repeat situation. With Triangle, and our sixty-one years of experience you know you are getting the best service the Largo, Clearwater, St Pete, Seminole and Palm Harbor areas have to offer.